In Ireland there is an old tradition of women singing laments at funerals to commemorate the passing of a loved one; but there are also said to be phantom women who sing laments for people before they die! The singers of these phantom laments are now called “Banshee,” believed to come from either “bean sidhe” (Irish for “woman fairy”) or “bean si” (“woman of peace” or “woman of the mound”). Some say banshees only sing for members of the five oldest Irish families ― the O’Gradys, the O’Neills, the O’Briens, the O’Conners, and the Kavanaghs ― but stories exist of banshees singing for other families too. It is also generally believed that people of great status may have banshees, no matter who their family is. When they are visible, Banshees always appear as human females; sometimes ghostly, sometimes solid but capable of supernaturally disappearing. Some people believe banshees are fairy women who care about the doomed people; fairies are said to be magical beings living in the British Isles. Others have theorized that the voices must be that of ghosts, perhaps of former members from the families of the doomed people. These are, however, only guesses about the nature of these beings. The earliest report of a banshee is in the memoirs of Lady Fanshawe, wife of a nobleman in the 17th century. In 1649 Lady Fanshawe and her husband visited the castle of Lady Honara O’Brien to stay for awhile... but at 1AM of their first night in the castle, Lady Fanshawe was awakened by a voice at the window of her room. She drew open the curtain to discover a woman was leaning in from the outside! This woman was lit by the moon, wore white, had red hair, and called out loudly in a strange voice ‘Ahone, Ahone, Ahone” (“Alas! Alas! Alas!”)... and then she simply vanished, her body fading into a sort of cloud before disappearing entirely, right in front of the now horrified Lady Fanshawe. Lady Fanshawe’s husband was very surprised when she woke him to tell him what happened... but both were even more surprised to find in the morning that a cousin of Lady Honara’s had died around 2AM in a different part of the castle, and that the lady had negleted to warn them of the spectre that always appeared in the room they were staying in when an O’Brien was dying. Not surprisingly, the Fanshawes made arrangements to leave as soon as possible. Some people who have described banshees and their behavior have also implied a worry that the banshees may not be predicting the deaths of people; they may somehow be causing their deaths. In 1772, in the week previous to the death of the Rev. Charles Bunworth, rector of Buttevant, Ireland, his friends, family, and house staff heard phantom songs and clapping; and one man claimed to have seen a banshee. When asked why he was crying, the house man, who had retrieved medicine for the Reverend, stated simply “the banshee has come for him.” The Reverend’s daughter wouldn’t hear of such nonsense; she was sure her father was getting better, so such dire predictions did not make sense to her. But soon there came a night when strange things happened. In front of the window of the Reverend’s room, a rosebush was pushed aside by something invisible as the sound of a woman singing laments was heard coming from there. Two men checked outside, but found no footsteps in the dirt by the rose and heard no sound; but inside the phantom wailing and clapping continued. The noise kept up until morning... when the Reverend passed away. On August 6th, 1801, Sir Jonah Barrington (Irish judge, lawyer, and politician) was awoken from his sleep at two in the morning by stange sounds that he described as resembling “neither a voice nor an instrument.” It seemed to come from no specific source, yet somehow the sounds filled him with dread. He woke his wife, who also heard it; and in walking about the room to investigate they found it now seemed to be coming from a spot on the grass just under their window. Lady Barrington called a maid to the room for another opinion, but the maid was even more terrified by the sounds than the Barringtons were. The sounds continued until around two-thirty, when a voice suddenly cried “Rossmore! Rossmore! Rossmore!,” then all was silent again. Lord Rossmore, former Commander-in-Chief of the British forces, was a family friend and lived just a short ways away from the Barringtons’ residence; and in fact, they were to attend a dinner party at his estate later the same day. Just after seven in the morning, however, the Barringtons were informed of Lord Rossmore’s unexpected death, earlier that morning... at around two-thirty. It is now a common belief that banshees have long, fine hair which they brush with combs the phantom women highly value. Some people also now say that if you see a fine comb on the ground in Ireland, you should never pick it up; a banshee might be waiting to spirit away the fool who touches it! This belief seems to be a newer addition to the legends of the banshee, based on a book published in 1903 called Darby O’Gill and The Good People, a fantasy adventure which included an episode in which Darby O’Gill found the end part of a banshee’s comb, though he didn’t know that was what it was at the time... then troubles ensued for his town when the banshee raised a host of ghosts to search everywhere for the missing piece. Exciting though the tale of Darby O’Gill and the banshee is, it’s just a good story; but it might have been based on an actual banshee report. In 1891 an account was published from Westmeath, Ireland, about a young man who had the audacity to steal a comb right from a banshee’s hand. 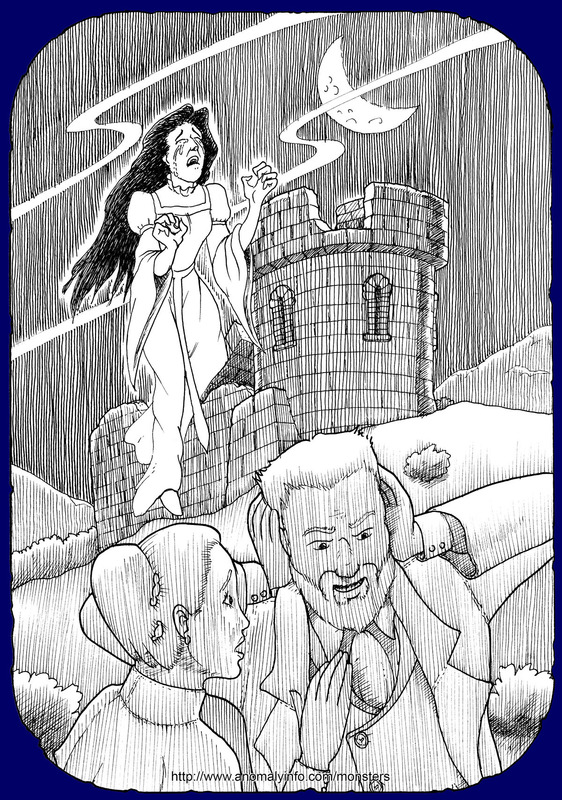 The banshee was not happy, and her screams haunted the young man until he was near dead... it was only then that the banshee allowed him to return the comb! So just remember if you find yourself visiting Ireland; be respectful of the legends of the banshee, lest they sing for YOU. Darby O'Gill and the Good People, by Herminie Templeton, 1903 McClure, Phillips & Co., New York, NY, USA. Pgs. 256-258. Online: Click here! The Dead Watchers, and Other Folk-lore Tales of Westmeath, by Patrick Bardan, 1891 Mullingar, Ireland. Pgs. 82. Online: Click here! Fairy Legends and Traditions of the South of Ireland: With a Short Memoir of the Author by His Son, by Thomas Crofton Croker, 1870 W. Tegg, London, United Kingdom. Pgs. 145-176. Online: Click here! Moville Inishowen Website: “Legend of the Banshee”, 2008 website for the town of Moville in North-West Ireland. Online: Click here! Personal interview with Siobhan Haslam about banshee legends her grandmother told her when she was young (2008). Personal Sketches of his Own Time, Vol. I, Third Edition, by Sir Jonah Barrington & Townsend Young, 1871 London, England. Pgs. 244-246.
Review of "Personal Sketches of his own times," by Sir Jonah Barrington, article in The Monthly Review, August 1827. Pgs. 586-588.